remarkable Impressions on many of the Hearers. Pastor of the Church of Christ in Northampton. Their foot shall slide in due time. In this verse is threatened the vengeance of God on the wicked unbelieving Israelites, who were God's visible people, and who lived under the means of grace; but who, notwithstanding all God's wonderful works towards them, remained (as verse 28) void of counsel, having no understanding in them. Under all the cultivations of heaven, they brought forth bitter and poisonous fruit; as in the two verses next preceding the text. — The expression I have chosen for my text, their foot shall slide in due time, seems to imply the following things, relating to the punishment and destruction to which these wicked Israelites were exposed. 1. That they were always exposed to destruction; as one that stands or walks in slippery places is always exposed to fall. This is implied in the manner of their destruction coming upon them, being represented by their foot sliding. The same is expressed, Psalm 72:18. "Surely thou didst set them in slippery places; thou castedst them down into destruction." 2. It implies, that they were always exposed to sudden unexpected destruction. As he that walks in slippery places is every moment liable to fall, he cannot foresee one moment whether he shall stand or fall the next; and when he does fall, he falls at once without warning: Which is also expressed in Psalm 73:18,19. "Surely thou didst set them in slippery places; thou castedst them down into destruction: How are they brought into desolation as in a moment!" 4. That the reason why they are not fallen already and do not fall now is only that God's appointed time is not come. For it is said, that when that due time, or appointed time comes, their foot shall slide. Then they shall be left to fall, as they are inclined by their own weight. God will not hold them up in these slippery places any longer, but will let them go; and then, at that very instant, they shall fall into destruction; as he that stands on such slippery declining ground, on the edge of a pit, he cannot stand alone, when he is let go he immediately falls and is lost. The observation from the words that I would now insist upon is this. — "There is nothing that keeps wicked men at any one moment out of hell, but the mere pleasure of God." — By the mere pleasure of God, I mean his sovereign pleasure, his arbitrary will, restrained by no obligation, hindered by no manner of difficulty, any more than if nothing else but God's mere will had in the least degree, or in any respect whatsoever, any hand in the preservation of wicked men one moment. — The truth of this observation may appear by the following considerations. 1. There is no want of power in God to cast wicked men into hell at any moment. Men's hands cannot be strong when God rises up. The strongest have no power to resist him, nor can any deliver out of his hands. — He is not only able to cast wicked men into hell, but he can most easily do it. Sometimes an earthly prince meets with a great deal of difficulty to subdue a rebel, who has found means to fortify himself, and has made himself strong by the numbers of his followers. But it is not so with God. There is no fortress that is any defence from the power of God. Though hand join in hand, and vast multitudes of God's enemies combine and associate themselves, they are easily broken in pieces. They are as great heaps of light chaff before the whirlwind; or large quantities of dry stubble before devouring flames. We find it easy to tread on and crush a worm that we see crawling on the earth; so it is easy for us to cut or singe a slender thread that any thing hangs by: thus easy is it for God, when he pleases, to cast his enemies down to hell. What are we, that we should think to stand before him, at whose rebuke the earth trembles, and before whom the rocks are thrown down? 2. They deserve to be cast into hell; so that divine justice never stands in the way, it makes no objection against God's using his power at any moment to destroy them. Yea, on the contrary, justice calls aloud for an infinite punishment of their sins. Divine justice says of the tree that brings forth such grapes of Sodom, "Cut it down, why cumbereth it the ground?" Luke 13:7. The sword of divine justice is every moment brandished over their heads, and it is nothing but the hand of arbitrary mercy, and God's mere will, that holds it back. 3. They are already under a sentence of condemnation to hell. They do not only justly deserve to be cast down thither, but the sentence of the law of God, that eternal and immutable rule of righteousness that God has fixed between him and mankind, is gone out against them, and stands against them; so that they are bound over already to hell. John 3:18. "He that believeth not is condemned already." So that every unconverted man properly belongs to hell; that is his place; from thence he is, John 8:23. "Ye are from beneath:" And thither he is bound; it is the place that justice, and God's word, and the sentence of his unchangeable law assign to him. 6. There are in the souls of wicked men those hellish principles reigning, that would presently kindle and flame out into hell fire, if it were not for God's restraints. There is laid in the very nature of carnal men, a foundation for the torments of hell. There are those corrupt principles, in reigning power in them, and in full possession of them, that are seeds of hell fire. These principles are active and powerful, exceeding violent in their nature, and if it were not for the restraining hand of God upon them, they would soon break out, they would flame out after the same manner as the same corruptions, the same enmity does in the hearts of damned souls, and would beget the same torments as they do in them. The souls of the wicked are in scripture compared to the troubled sea, Isa. 57:20. For the present, God restrains their wickedness by his mighty power, as he does the raging waves of the troubled sea, saying, "Hitherto shalt thou come, but no further;" but if God should withdraw that restraining power, it would soon carry all before it. Sin is the ruin and misery of the soul; it is destructive in its nature; and if God should leave it without restraint, there would need nothing else to make the soul perfectly miserable. The corruption of the heart of man is immoderate and boundless in its fury; and while wicked men live here, it is like fire pent up by God's restraints, whereas if it were let loose, it would set on fire the course of nature; and as the heart is now a sink of sin, so if sin was not restrained, it would immediately turn the soul into fiery oven, or a furnace of fire and brimstone. 8. Natural men's prudence and care to preserve their own lives, or the care of others to preserve them, do not secure them a moment. To this, divine providence and universal experience do also bear testimony. There is this clear evidence that men's own wisdom is no security to them from death; that if it were otherwise we should see some difference between the wise and politic men of the world, and others, with regard to their liableness to early and unexpected death: but how is it in fact? Eccles. 2:16. "How dieth the wise man? even as the fool." But the foolish children of men miserably delude themselves in their own schemes, and in confidence in their own strength and wisdom; they trust to nothing but a shadow. The greater part of those who heretofore have lived under the same means of grace, and are now dead, are undoubtedly gone to hell; and it was not because they were not as wise as those who are now alive: it was not because they did not lay out matters as well for themselves to secure their own escape. If we could speak with them, and inquire of them, one by one, whether they expected, when alive, and when they used to hear about hell, ever to be the subjects of misery: we doubtless, should hear one and another reply, "No, I never intended to come here: I had laid out matters otherwise in my mind; I thought I should contrive well for myself — I thought my scheme good. I intended to take effectual care; but it came upon me unexpected; I did not look for it at that time, and in that manner; it came as a thief — Death outwitted me: God's wrath was too quick for me. Oh, my cursed foolishness! I was flattering myself, and pleasing myself with vain dreams of what I would do hereafter; and when I was saying, Peace and safety, then sudden destruction came upon me." The use of this awful subject may be for awakening unconverted persons in this congregation. This that you have heard is the case of every one of you that are out of Christ. — That world of misery, that lake of burning brimstone, is extended abroad under you. There is the dreadful pit of the glowing flames of the wrath of God; there is hell's wide gaping mouth open; and you have nothing to stand upon, nor any thing to take hold of; there is nothing between you and hell but the air; it is only the power and mere pleasure of God that holds you up. The God that holds you over the pit of hell, much as one holds a spider, or some loathsome insect over the fire, abhors you, and is dreadfully provoked: his wrath towards you burns like fire; he looks upon you as worthy of nothing else, but to be cast into the fire; he is of purer eyes than to bear to have you in his sight; you are ten thousand times more abominable in his eyes, than the most hateful venomous serpent is in ours. You have offended him infinitely more than ever a stubborn rebel did his prince; and yet it is nothing but his hand that holds you from falling into the fire every moment. It is to be ascribed to nothing else, that you did not go to hell the last night; that you were suffered to awake again in this world, after you closed your eyes to sleep. And there is no other reason to be given, why you have not dropped into hell since you arose in the morning, but that God's hand has held you up. There is no other reason to be given why you have not gone to hell, since you have sat here in the house of God, provoking his pure eyes by your sinful wicked manner of attending his solemn worship. Yea, there is nothing else that is to be given as a reason why you do not this very moment drop down into hell. 1. Whose wrath it is: it is the wrath of the infinite God. If it were only the wrath of man, though it were of the most potent prince, it would be comparatively little to be regarded. The wrath of kings is very much dreaded, especially of absolute monarchs, who have the possessions and lives of their subjects wholly in their power, to be disposed of at their mere will. Prov. 20:2. "The fear of a king is as the roaring of a lion: Whoso provoketh him to anger, sinneth against his own soul." The subject that very much enrages an arbitrary prince, is liable to suffer the most extreme torments that human art can invent, or human power can inflict. But the greatest earthly potentates in their greatest majesty and strength, and when clothed in their greatest terrors, are but feeble, despicable worms of the dust, in comparison of the great and almighty Creator and King of heaven and earth. It is but little that they can do, when most enraged, and when they have exerted the utmost of their fury. All the kings of the earth, before God, are as grasshoppers; they are nothing, and less than nothing: both their love and their hatred is to be despised. The wrath of the great King of kings, is as much more terrible than theirs, as his majesty is greater. Luke 12:4,5. "And I say unto you, my friends, Be not afraid of them that kill the body, and after that, have no more that they can do. But I will forewarn you whom you shall fear: fear him, which after he hath killed, hath power to cast into hell: yea, I say unto you, Fear him." 2. It is the fierceness of his wrath that you are exposed to. We often read of the fury of God; as in Isa. 59:18. "According to their deeds, accordingly he will repay fury to his adversaries." So Isa. 66:15. "For behold, the Lord will come with fire, and with his chariots like a whirlwind, to render his anger with fury, and his rebuke with flames of fire." And in many other places. So, Rev. 19:15, we read of "the wine press of the fierceness and wrath of Almighty God." The words are exceeding terrible. If it had only been said, "the wrath of God," the words would have implied that which is infinitely dreadful: but it is "the fierceness and wrath of God." The fury of God! the fierceness of Jehovah! Oh, how dreadful that must be! Who can utter or conceive what such expressions carry in them! But it is also "the fierceness and wrath of almighty God." As though there would be a very great manifestation of his almighty power in what the fierceness of his wrath should inflict, as though omnipotence should be as it were enraged, and exerted, as men are wont to exert their strength in the fierceness of their wrath. Oh! then, what will be the consequence! What will become of the poor worms that shall suffer it! Whose hands can be strong? And whose heart can endure? To what a dreadful, inexpressible, inconceivable depth of misery must the poor creature be sunk who shall be the subject of this! Consider this, you that are here present, that yet remain in an unregenerate state. That God will execute the fierceness of his anger, implies, that he will inflict wrath without any pity. When God beholds the ineffable extremity of your case, and sees your torment to be so vastly disproportioned to your strength, and sees how your poor soul is crushed, and sinks down, as it were, into an infinite gloom; he will have no compassion upon you, he will not forbear the executions of his wrath, or in the least lighten his hand; there shall be no moderation or mercy, nor will God then at all stay his rough wind; he will have no regard to your welfare, nor be at all careful lest you should suffer too much in any other sense, than only that you shall not suffer beyond what strict justice requires. Nothing shall be withheld, because it is so hard for you to bear. Ezek. 8:18. "Therefore will I also deal in fury: mine eye shall not spare, neither will I have pity; and though they cry in mine ears with a loud voice, yet I will not hear them." Now God stands ready to pity you; this is a day of mercy; you may cry now with some encouragement of obtaining mercy. But when once the day of mercy is past, your most lamentable and dolorous cries and shrieks will be in vain; you will be wholly lost and thrown away of God, as to any regard to your welfare. God will have no other use to put you to, but to suffer misery; you shall be continued in being to no other end; for you will be a vessel of wrath fitted to destruction; and there will be no other use of this vessel, but to be filled full of wrath. God will be so far from pitying you when you cry to him, that it is said he will only "laugh and mock," Prov. 1:25,26,&c. 3. The misery you are exposed to is that which God will inflict to that end, that he might show what that wrath of Jehovah is. God hath had it on his heart to show to angels and men, both how excellent his love is, and also how terrible his wrath is. Sometimes earthly kings have a mind to show how terrible their wrath is, by the extreme punishments they would execute on those that would provoke them. Nebuchadnezzar, that mighty and haughty monarch of the Chaldean empire, was willing to show his wrath when enraged with Shadrach, Meshach, and Abednego; and accordingly gave orders that the burning fiery furnace should be heated seven times hotter than it was before; doubtless, it was raised to the utmost degree of fierceness that human art could raise it. But the great God is also willing to show his wrath, and magnify his awful majesty and mighty power in the extreme sufferings of his enemies. Rom. 9:22. "What if God, willing to show his wrath, and to make his power known, endured with much long-suffering the vessels of wrath fitted to destruction?" And seeing this is his design, and what he has determined, even to show how terrible the unrestrained wrath, the fury and fierceness of Jehovah is, he will do it to effect. There will be something accomplished and brought to pass that will be dreadful with a witness. When the great and angry God hath risen up and executed his awful vengeance on the poor sinner, and the wretch is actually suffering the infinite weight and power of his indignation, then will God call upon the whole universe to behold that awful majesty and mighty power that is to be seen in it. Isa. 33:12-14. "And the people shall be as the burnings of lime, as thorns cut up shall they be burnt in the fire. Hear ye that are far off, what I have done; and ye that are near, acknowledge my might. The sinners in Zion are afraid; fearfulness hath surprised the hypocrites," &c.
Are there not many here who have lived long in the world, and are not to this day born again? and so are aliens from the commonwealth of Israel, and have done nothing ever since they have lived, but treasure up wrath against the day of wrath? Oh, sirs, your case, in an especial manner, is extremely dangerous. Your guilt and hardness of heart is extremely great. Do you not see how generally persons of your years are passed over and left, in the present remarkable and wonderful dispensation of God's mercy? You had need to consider yourselves, and awake thoroughly out of sleep. You cannot bear the fierceness and wrath of the infinite God. — And you, young men, and young women, will you neglect this precious season which you now enjoy, when so many others of your age are renouncing all youthful vanities, and flocking to Christ? You especially have now an extraordinary opportunity; but if you neglect it, it will soon be with you as with those persons who spent all the precious days of youth in sin, and are now come to such a dreadful pass in blindness and hardness. — And you, children, who are unconverted, do not you know that you are going down to hell, to bear the dreadful wrath of that God, who is now angry with you every day and every night? Will you be content to be the children of the devil, when so many other children in the land are converted, and are become the holy and happy children of the King of kings? 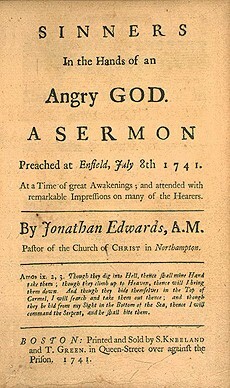 Jonathan Edwards (1703-1758) was born in East Windsor, Connecticut, where his father was pastor. The only son in a family of eleven children, he entered Yale when he was not yet thirteen and graduated four years later at the head of his class. He preached in a Presbyterian pulpit in New York, and in 1724 returned to Yale as tutor for two years. In 1728 he succeeded his maternal grandfather as pastor at Northampton, Massachusetts, where his preaching brought remarkable religious revivals. But he alienated many of his congregation in 1748 by his proposal to admit to the Lord's Supper only those who gave satisfactory evidence of being truly converted. He was dismissed in 1750. He moved to Stockbridge, Massachusetts, then a frontier settlement, where he ministered to a tiny congregation and served as missionary to the Housatonic Indians. There, having more time for study and writing, he completed his celebrated work, The Freedom of the Will. For more information about Jonathan Edwards see Jonathan Edwards, America's Greatest Theologian (Resource page by John W Hendryx at Monergism.com).